The Mansfield branch of Nottingham Credit Union has celebrated its second birthday by raising over £100 for chosen charity, Mansfield Arthritis Support Group. The credit union marked the occasion with a tombola and cupcakes to fundraise. Branch manager Marie Haywood said: “We moved into this office in November 2015 so that we could be more visible and closer to people in the local community. We have 650 members in the Mansfield area who we serve with affordable, ethical, financial products and to date we’ve lent out over £525,000 to the local community in loans. “We place a strong importance on financial education and offer our members a one to one based service. Our staff take the time to sit with members and go through a budget planner, income and expenditure and look for areas where we might be able to save money for members – for example, we just helped one lady save half the cost of her water bill. We look to try and improve everyone’s financial situations as a whole. The Mansfield branch of Nottingham Credit Union also gives talks and visits the local community to help with financial education, including local Sure Start Centre, Mansfield Council and Ashfield District Council. The Mansfield branch of Nottingham Credit Union is open Tuesday to Friday between 9.30am and 2.30pm. It’s now only six weeks until Christmas! 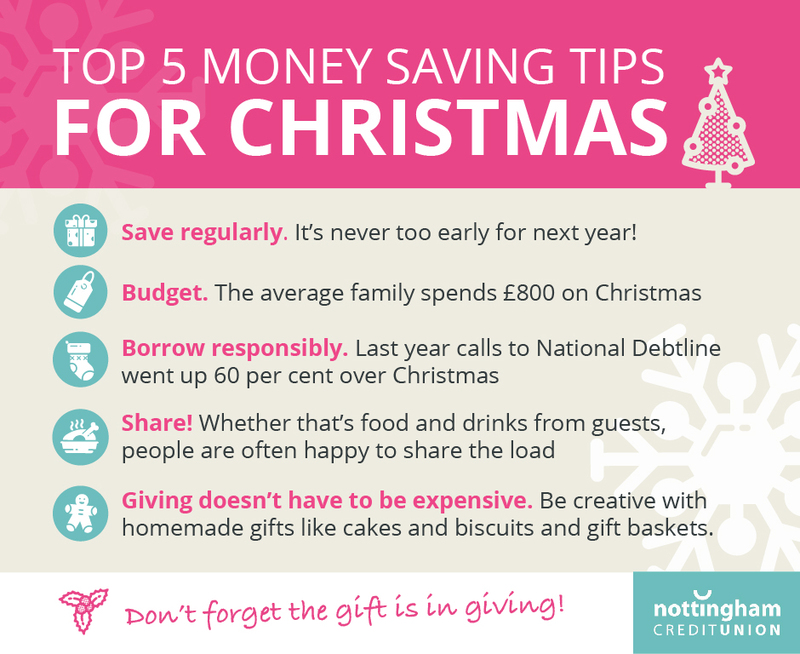 The festive season is always one for overdoing it on too much turkey, but at Nottingham Credit Union we want to help you make sure that your festive hangover isn’t a financial one which sticks around, by giving you our top 5 money saving tips. Christmas is traditionally a time of year for the giving and receiving of gifts rather than money saving, but last year the Money Advice Trust flagged that over 16.9million of us borrow to cover the cost of Christmas and that 76 percent (12.8million) use credit cards and 2.6million use high-cost catalogue credit. We’ve compiled some top money saving tips for Christmas but, if you must borrow, borrow responsibly and affordably as it is all too easy to get trapped in the debt cycle with payday loans and high-interest borrowing. We know that Christmas can be an expensive time of year and, if you do need to borrow, Nottingham Credit Union can offer you a low-cost loan (and ways to help you save for next Christmas at the same time). We are not for profit and don’t impose any early repayment charges or penalties. Whether you have already saved with us for Christmas or you need to borrow a little more, you can register for our easy, safe and secure online and mobile banking here to have access to your money within three hours. To find out more, call us on 0115 828 3121 or apply on our website. Tags: better money management, credit union, loans, money goals for 2017, and savings.